Dream had been outside already on her tie-out around six, then back in to spend a bit more time snuggling under the sheets with her Daddy before he left for work, but she insisted on going out again at eight thirty so I clipped on her leash and off we went. I thought we'd do a walk 'round the backyard but Dream first wanted to sniff all the tires on my Jeep and DS's truck. Tires carry many smells and messages from other places ( some doggie folks refer to it as 'pee mail' ) and must be thoroughly inspected. After all the information was gathered, we moved on to the flower bed, which really should be called the weed bed at this point in time. A few Heathers have 'escaped' from the original bed and are now naturalized in the lawn. So far DH has remembered they're there and hasn't determined that they were ' . . . . just weeds, so I mowed them down . . . . ' We won't discuss the plants that became mulch in past years. 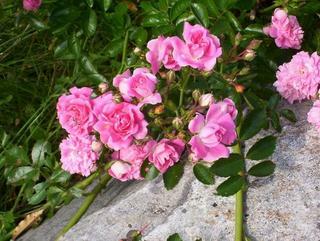 At the edge of the hill this beautiful pink moss rose bush grows over the big rock . . . . I will have to get some pictures of the Heathers and post them later. Also the Honeysuckle on the stonewall. As we moved along the edge of the hill in the backyard we past my Bridal Wreath. I never took any pictures of it this year as it didn't have much of a show. Maybe the long snowy winter and extremely rainy spring was just too much for it. Hopefully it will come back next year. Be nice if a real spring would show up next year too. On to say Good Morning to Harry. If you've been reading my blog for a while you would have met Harry, the Oak Tree a while ago. By this time, I realized that Dream didn't have anything special to do outside, she just wanted to go for a walk and had conned me again, so we went back inside to the waiting housework and freshly baked chocolate cake to frost as soon as it cooled.